There are so many cool places around these days and it can be hard to choose where to go or commit to making plans. Billy’s tries to make it easy for you with a wide array of specials throughout the week that appeal to so many. One of our favorite days of the week is Tuesday. Why is that? Well, every Tuesday is BAMA-Brews-DAY! What does that mean? Every Tuesday at all Billy’s locations you can enjoy some of the best beer out there that is made right here in our home state of Alabama for HALF OFF! That’s right! 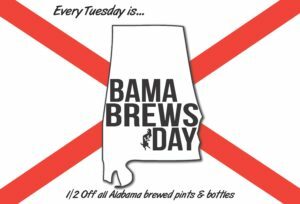 All Alabama brewed pints and bottles are half priced all day every Tuesday. So there are a few that you have heard about and you are dying to try. Here is your chance without the heavy commitment of a 6-pack or the dent in your wallet. The cool thing is we are constantly adding new beers whether it is on tap or in a bottle. So make plans to join us on Tuesday for #BAMABrewsDay .